Michelin Star Hawker in Singapore: Hong Kong Soya Sauce Chicken Rice, Is It Worth The Queue? On the day we went to Singapore for Halloween Horror Nights 6 at Universal Studio Singapore, we landed at about 10 am and we were wondering what should we do while waiting for the HHN? 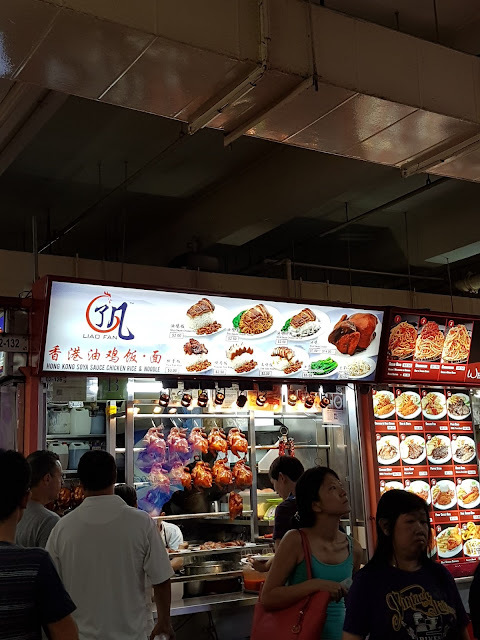 One of my friend said she wanted to try the michelin chicken rice sooo bad. I was like...what?! 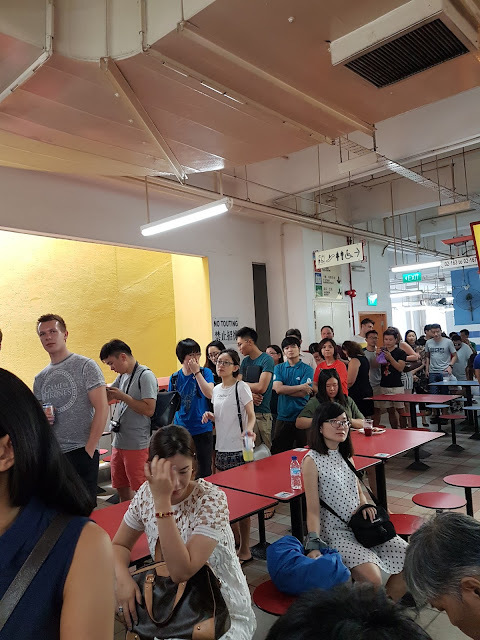 Not because I hate chicken rice but I was already imagining the queue. THE QUEUE, ladies & gentlemen, was not a joke. 1 hour and 40 minutes, the total time we queued. My feet were hurt. My stomach was growling. Lucky there were 8 of us queuing, so we could have fun chat while waiting. 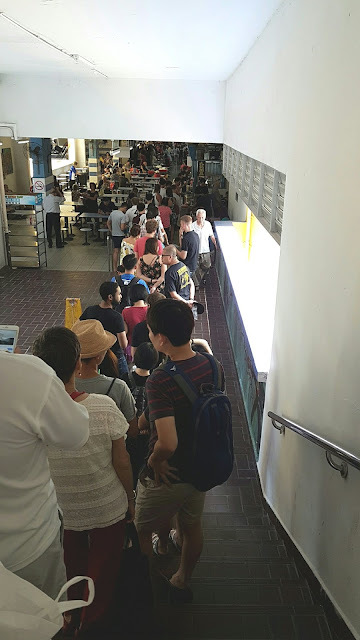 My friend who stays in Singapore said once she queued for 3 hours. WHAT?! We decided to order different foods. 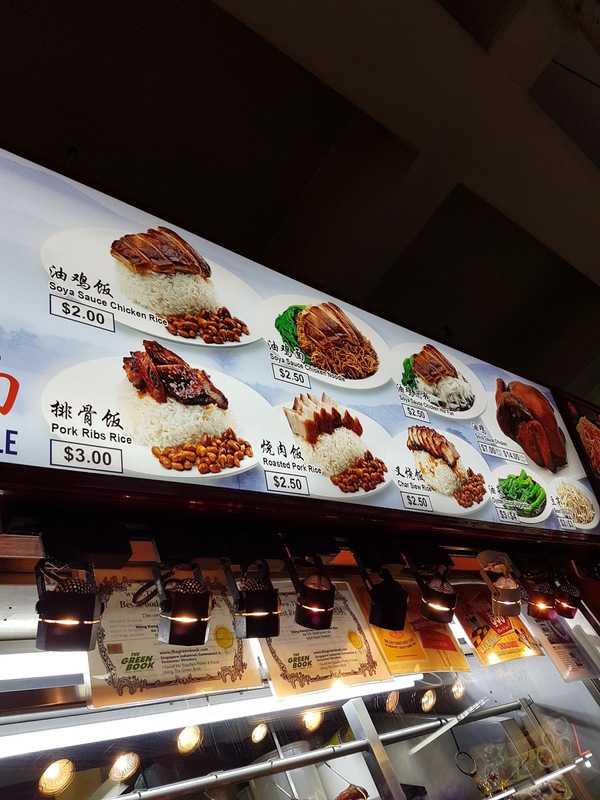 I changed my mind at the last minute from chicken rice to pork rice. The rest of us ordered chicken rice, chicken noodle, vegetables, and shahe fen (?). Even though it's famous with its chicken rice, but for us, all meals were d*mn delicious! 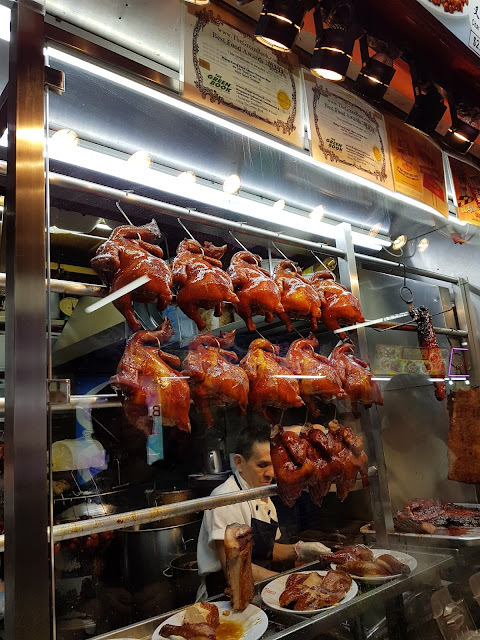 I'm pretty sure it's not because we were starving due to the long queue, but it was THAT delicious. 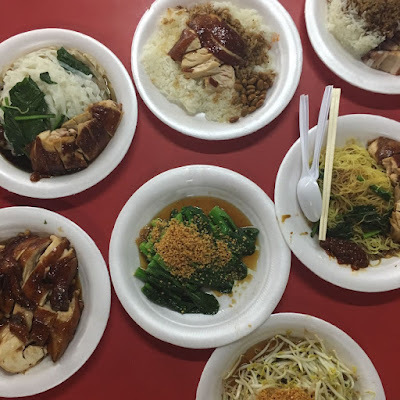 For SGD 2.50 per serving, I had no complain about the food. So, will I ever come to this place again? Unless someone is willing to queue for me, I think one visit is enough. I can't be that patient in queuing for the second time, hahaha. If you're starving and any food is fine for you, don't come here. If you're queuing alone, bring snack and drink to fill your stomach while queuing. Trust me, queuing is tiring. If you're a girl in your period time, don't come here unless you can make sure that you won't be cranky about the situation you will see there. When it comes to your turn, order quickly and clearly. You had over an hour to think what you want to order. Don't let the Auntie yells at you because you pause for too long just to think about what you want to order. When you are already in front of the stall, don't stand blocking the stall's entrance. Or the Auntie will yell at you. She needs to move fast to serve all of those hungry people. DO NOT EVER THINK ABOUT CHEATING THE QUEUE. Other people there are as hungry as you are. Ok, before I start my storytelling about Halloween Horror Nights (HHN) 6 at USS, I want to say: that was the most absurd weekend ever. A trip to Singapore was not on my trip list for 2016. It was truly an impulsive trip. Flights and hostel were just booked one week before we went there. I almost missed my flight because I almost forgot I had a morning flight to catch, so I overslept hahaha. I hate ghosts. I'm an adrenaline junkie BUT NOT ghosts. What was I thinking, having my first visit to USS at Halloween Night?! One week before, a friend gave me one free admission ticket and one express pass. Then, it was already too late for me to realize that it was pretty much a suicide mission. I was already inside the darkness of HHN6. At about 5pm, USS closed its park to prepare their park for HHN. The park was re-opened again with totally different ambiance 7.30 pm until you pee your pants 12.30 or 1.30 am (depending what date you choose). Oh, please be noted that Halloween Horror Nights only happen on selected date. So, make sure you check out their website for more detail info. Our faces, not knowing what was going on inside the park. The queue to get inside the park. After entering the park, we were welcomed with a special show on the stage and a parade! As My Chemical Romance said, welcome to the black parade! Zombie. Dancing. Quite a talent. At this time, we still had our laugh and giggle left. The Queen and her fancy ride. Enough the shows and jokes, time for the real thing. The first part we walked into was The Suicide Forest. Although it was called Scares Zone, I didn't think it was that scary. Maybe because the zone was too crowded (seriously, I sweated a lot. We should call it a sauna instead of forest) and my night vision was not too good. The only thing that scared me in that forest was the fear I accidentally separated myself from my group and ended up riding everything alone. Sounds so sad. Since the zone was too crowded, you may not realize some ghosts already blend with the crowd. Ghosts' appearance are not too scary in my opinion. But still, if you suddenly see them walking along beside you, it will shock you (one of my friend spontaneously jumped and ran away, hahaha). And watch out your feet too. They may crawl next to your feet. Exited from The Suicide Forest, you can choose to enter haunted houses or join the rides. I didn't enter even one of the haunted house. Call me a scaredy cat, but I seriously was exhausted and not in the mood to line up just to get scared. My friends who tried some of the haunted houses said those were pretty scary. For someone who was in my first time riding USS's rides, I was disappointed. I actually expected the higher rides. But when riding Galactica at night was really breathtaking. You can see the night view of Singapore beautifully. I like it! I was glad I saw nothing that might ruin my childhood, like maybe Elmo who suddenly breaks his jaw or Cookie Monster's eyeballs that might fall apart or come with the splash of blood on their body. I can say, my childhood is safe. 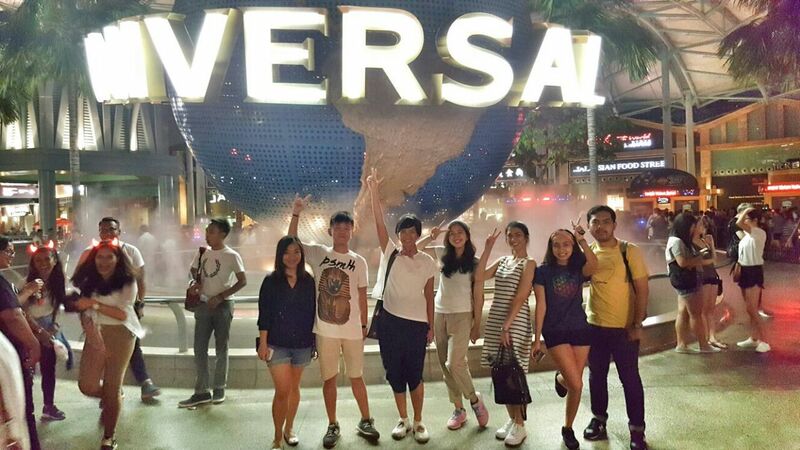 We left the park at 11.30 pm, right when the last train to Vivo City arrived. So, for you who needs to go back to Vivo City, make sure you are able to catch the last train. Awal November 2016 ini, aku, adik dan ibuku akan traveling ke Korea. Sebenarnya plan trip ke Korea ini di luar plan trip tahunanku, apalagi resolusi (Mei kan baru balik dari Osaka =.=). Aku bukan fans K-Pop (yeah, I'm a J-Pop freak), bukan juga fans makanan Korea. Jadi nggak ngerti kenapa aku harus ke Korea. Seriously, personal preference, aku lebih prefer ke Jepang berkali-kali sampai punggung bongkok daripada harus ke Korea. Pada suatu random lunch di bulan Juli 2016, adikku yang cowok merengek agar mau nemenin dia trip ke luar negeri. Maklum, first jobber. Gaji belum kepake apa-apa kecuali bayar kosan dan makan di warteg, trus cutinya baru dipakai 2 hari. Ya sudah, berhubung kita lagi di Aeon Mall dan dicuci otak sama video-video destinasi di Jepang, akhirnya kita putuskan untuk winter-an di Tokyo. Tapi malamnya aku berubah pikiran. Semuanya gara-gara nonton Running Man dan mereka lagi makan bibimbap. Iya. Aku seimpulsif itu. Yang Aquarius pasti ngerti. Aku chat adikku dan bilang gimana kalau kita ke Seoul aja tapi autumn-an? Honestly, (selain gara-gara bibimbap) aku lebih takut berubah jadi Olaf pas winter, dibanding pengen liat autumn foliage. Dan adikku bilang oke. Takut dikutuk jadi batu Kita juga ngajak ortu kita, tapi yang bisa pergi cuma emak. Sedangkan babeh nggak dapet cuti katanya. Kesian. Beli tiket udah. Nyusun itinerary udah. Nah, sampailah di tahap akan membuat visa yang bikin aku sakit kepala. Beneran deh. Ngurus visa nggak pernah sepusing ini sebelumnya. Formulir aplikasi visa. Download di sini dan isi. Nah, poin terakhirlah yang bikin aku sakit kepala. Sebelumnya, poin itu kita bisa pilih beberapa opsi dari bukti keuangan, misalnya kartu keanggotaan golf, kartu keanggotaan hotel bintang 5, copy rekening, slip gaji, SPT, dll. Sekarang udah ditentuin dan begitulah adanya. Buat yang tanya untuk hotel aku bikin dummy booking atau booking beneran, aku booking beneran (serius!) satu kamar apartemen di Airbnb. Kenapa? Karena kamar Airbnb yang aku booking cepet banget penuhnya. Bayangin aja. Semalem cuma sekitar Rp 1 juta, tapi dapet kamar bagus yang muat buat 4 orang! 4 ORANG! Ada heater, mini kitchen, mesin cuci, private bathroom, TV, dan dikasi poket wifi buat dibawa-bawa pula! Hostnya supeeer baik dan ramah. Dan yang paling penting adalah LOKASI. Yang udah baca postinganku sebelum-sebelumnya pasti tau kalau lokasi adalah pertimbangan pertama dalam memilih akomodasi buat aku. Dan kamar apartemen ini tempatnya persis di atas Anguk Station! Yang udah pernah ke Seoul pasti tau seberapa vitalnya Anguk Station buat traveler. Insadong ada di belakang. Changdeokgung Palace, Gyeongbokgung Palace, Bukchon Hanok village dan Samcheongdong cuma selemparan kolor (eh, maaf). Airport bus 6011 juga berhenti persis, sekali lagi: PERSIS, di depan si apartemen. Lucky me, apartemen doi pas banget cuma kosong di tanggal visitku, jadi tanpa basa-basi lagi, langsung aja aku booking. Yang mau tau lebih detail soal apartemenku di Seoul, bisa klik di sini. Nanti aku akan bikin satu post lagi untuk review apartemennya deh. OH! Kalau kalian baru mau bikin account Airbnb, kalian bisa dapet diskon sekitar Rp 295.000 atau sekitar USD 22 kalau pakai kode promoku. Simply click here or visit https://www.airbnb.com/c/pmayasari1?s=8. Asik kan? Aman. Semua persyaratan ada. Bahkan aku nggak ngelampirin SIUP dan surat referensi bank. Aman juga. Walaupun si emak nggak ngelampirin rekeningnya sendiri, tapi dengan surat pernyataan dariku & adikku yang akan menanggung biaya tripnya plus rekening koranku & adikku, visanya keluar kok. Errggh. I hate this part. Ini cuma perkara SPT. Serius. Gara-gara nggak ada selembar bukti potong pajak itu, urusannya jadi ribet. Jadi please note, SPT PPH-21 itu PENTING buat dilampirin. Suratnya ditandatanganin di atas materai dan aku lampirin copy NPWP-nya. Belum, sodara-sodara! Pihak embassy minta copy ijazah. Err...oke. Besok aku akan kasi copy ijazahnya dan aku update lagi perkembangannya. Semoga lolos visanya si bontot ini. Astungkara. Tiga hari setelah ngasi copy ijazah S1nya si bontot, visanya akhirnya keluar juga. Asik! Jadi, bagi yang belum punya SPT pajak karena first jobber (baru lulus S1), bisa pakai surat pernyataan, copy NPWP, dan copy ijazah S1. Kalau perlu contoh surat pernyataannya, drop a comment ya. I will be happy to share to you. Anyway, aku pakai jasa agen untuk mengurus visa-visa kami. Bukan agen besar macem Dwidaya, Bayu Buana, dll. Tapi sebenernya pegawai anak perusahaan sebelah yang sering ngurusin visa-visa orang kantorku & kantor doi. Bapaknya baik banget. Aku sampai kasihan bapaknya harus bolak-balik gara-gara SPT ini. Di satu sisi aku bersyukur pakai jasa si bapak (sebelumnya selalu urus sendiri) karena aku pasti nggak sanggup bolak-balik begitu. 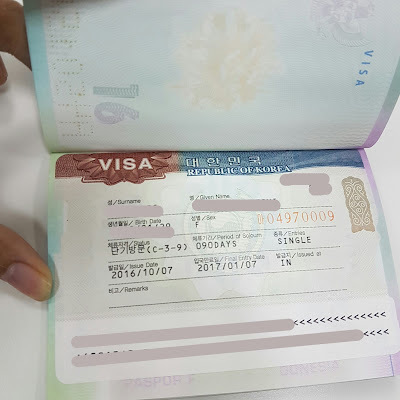 Untuk mengurus visa Korea Selatan kita bisa datang ke Consular Section Kedutaan Korea Selatan, yang letaknya di sebelah persis dari Kedutaan Korea Selatan di Jalan Jenderal Gatot Subroto Kav. 57 Jakarta Selatan 12950. Katanya kalau naik busway, turun di halte Tegal Parang.